Island visited by 15 members. Inishark, occupied for thousands of years, has numerous prehistoric monuments, including burial grounds and hut sites. However, its exposure to vicious Atlantic storms meaning no one could land on the island for weeks on end, combined with numerous tragic drownings, convinced the Irish government to finally evacuate the island’s remaining residents, rather than attempt to build a costly new pier. The very lifeblood of the population having been drained by decades of migration, the last two dozen inhabitants of this isolated fishing and farming community closed the doors of their respective homeplaces forever in October 1960 and, with all of their worldly possessions and livestock, departed in a flotilla of boats and curraghs for the mainland. A rich folklore was consigned to history with the migration of the inhabitants. One such custom was the crowning of a king, whose duties included translating the British landlord’s English into Gaelic for the islanders, deciding when and what to fish for and dividing the valuable seaweed harvest among the islanders for crop fertilisation. The Irish language film, Inis Airc, Bás Oileáin (Inishark, Death of an Island), (2006), tells the islanders’ story of the evacuation. 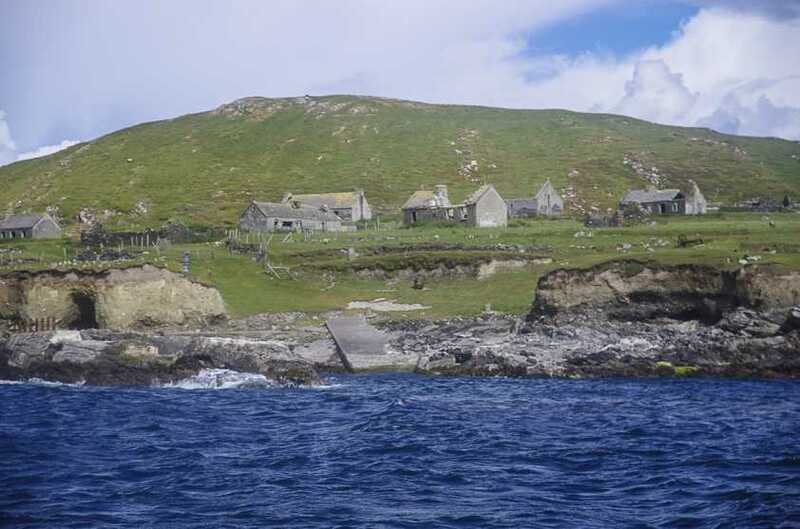 Above the old harbour, where it is often dangerous to disembark due to submerged rocks, is the deserted village, slowly being consumed by the elements. It is evocative to wander amid the nettle choked ruins of these old homesteads which once rang with the sound of human voices, where now only the lowly sighing of the wind whistling through the exposed rafters can be heard. St. Leo’s Church, open to the sky and named for the island’s patron saint, Leo of Inis Airc who lived here some time between the sixth and eighth centuries, cuts a somewhat forlorn presence at the heart of the old village. Right above the Atlantic Ocean, the old boreens covered in weeds and lined by broken down field hedges behind which lie ghostly ridges of lazy beds once verdant with the foliage of life-giving potatoes, lend a melancholy beauty to this wild island. Inishark is home to Gannets, Guillemots, Arctic terns, Red-billed oystercatchers and Fulmars, nesting in great profusion on the island’s magnificent palisades and where the Atlantic has bitten the cliffs into sharp, narrow coves. The screaming of nesting herring gulls is incessant. In May of 2014, at least two Corncrakes were recorded on the island, confined mainly to the nettle patches around the abandoned cottages due to the presence of sheep, which graze unfettered across the entire island and have eaten the vegetation right down to the ground. The noisy chit chat of Wheatears is ubiquitous and you may get buzzed by Great Skuas, whose numbers appear to be on the increase.